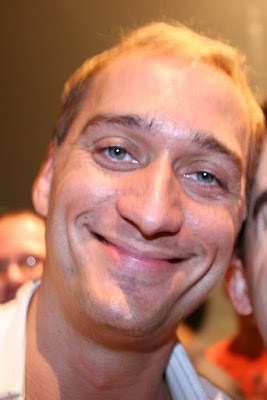 Paul Van Dyk was born in Eisenhuettenstadt in East Germany in 1971. He grew up in communist East Berlin, but had a keen interest in music from an early age and used to listen to house music on radio stations broadcasting from the other side of the Berlin Wall. When the Wall finally came down in 1989, an underground club culture quickly evolved in Berlin and Paul started DJing around the city in clubs like Tresor. He began producing his own records in 1992 - his first release was a collaboration with Cosmic Baby under the Visions Of Shiva monica (available on Transformed From Beyond). Paul first achieved mass acclaim with his remix of Humate's "Love Stimulation" which was a big club smash in 1993. Paul went on to remix many renowned artists such New Order, Sven Vath and Tori Amos (on BT's "Blue Skies"). The release of Pauls second album "Seven Ways" really brought his music to the masses. It was very well received by music critics across Europe and sold by the bucketful, assisted its big singles "Beautiful Place", "Forbidden Fruit" and "Words". At the same time as producing some of the most melodic and exciting trance around, he was also gaining a reputation for being THE DJ to see live. 1998 saw him release one of the all-time great trance classics in For An Angel which went on to chart highly. In the same year, he remixed Blank & Jones' "Cream" and Binary Finary's "1998", both huge tracks in clubs all over Europe. in 1999 Paul won a plethora of awards including Best International DJ by both Ministry Of Sound magazine and the 1999 Music Awards in London. He was also named Mixmag's Man Of The Year. Paul released his third album "Out There and Back" in 2000 which was also gratefully received by an adoring public. He released his fourth album, Reflections, in 2003 and the first single from the album "Nothing But You" was a massive hit across Europe with its evocative Norwegian vocals. Paul continues to DJ and record and is still one of the biggest names in dance music.